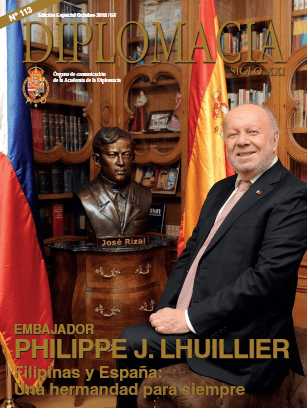 Cebuana Lhuillier founder and Philippine Ambassador to Spain Philippe Jones Lhuillier graces the cover of Diplomacia Magazine. In this October 2018 issue, the ambassador highlights his diplomatic work, the thriving relationship between the Philippines and Spain, and his enduring love for the Filipino community. How is the Philippines doing? The Philippines has been enjoying a period of continuous economic growth of over 6 percent annually for the past several years. In fact, the country just recorded 6.8 percent GDP growth in the first quarter of 2018, which makes the Philippines one of the best performers not just in Asia but in the world. This is the tenth consecutive quarter that the Philippine economy was able to achieve an output expansion of 6.5 percent or above. This performance demonstrates that the groundwork for reforms in many of our country’s sectors has been sustaining growth. Under Build! Build! Build!, the Philippine Government’s landmark infrastructure program, we continue in our forward trajectory in providing jobs, enhancing connectivity, and ensuring dependable delivery of public services. With the outstanding showing of the economy, our Economic Planning Ministry has reported that the Philippines is poised to become an upper-middle income economy as early as next year. President Rodrigo Duterte, in his State of the Nation Address, stated his desire to focus on the country’s safety and security, and at the same time, its prosperity. The President invites the establishment of more businesses and wishes to simplify all government agency processes and cut red tape. He also reiterated his promise to reform the tax system and ensure reliable, affordable, and secure telecommunications services. The Philippine government remains committed to achieving our goals and to making this growth inclusive for all. How do you characterize the relations between the Philippines and Spain? Last year we celebrated a milestone in our relations when we celebrated the 70th anniversary of diplomatic relations. Since then, we have concluded over 60 bilateral agreements in various fields. These include agreements on education and sports, cultural cooperation, tourism, technology, investments and other equally important areas. The most recent of these is the Air Transport Agreement, signed on 12 June 2018. These agreements attest to the fact that the Philippines and Spain have been striving together to strengthening our relations through the years. It is also worth mentioning that, on top of these agreements, the Philippines enacted a law on 22 July 2002 marking the 30th of June of every year thereafter as “Philippine-Spanish Friendship Day.” The law (Republic Act No. 9187) was approved on February 5, 2003, and it further sealed the bond of friendship between the Philippines and Spain. “Philippine-Spanish Friendship Day” commemorates the cultural and historical ties of friendship and cooperation between our two countries. It is declared as a national special working holiday and a special non-working holiday in Aurora Province in the Philippines. Through the years, we have also seen high-level visits from both countries. We had Queen Sofia visiting the Philippines in 2012 and former President Aquino visiting Spain in September 2014. We have a mechanism that takes stock and looks into the future of the bilateral relations through a high-level political consultation between Spanish and Philippine diplomatic officials. Overall, the Philippine-Spanish relations can be characterized as strong and vibrant. What is your vision for PH-Spain relations? How can PH-Spain relations move forward? The level of engagement between the Philippines and Spain, as well as its quality and quantity, speaks volumes concerning the direction that we want to take as far as our bilateral relations are concerned. These past years, we have seen the emergence of Philippine investments in Spain, notably in wine manufacturing and real estate. We feel confident about the strong possibility of major Philippine brands coming into Spain in the next few years. Likewise, Spanish investments and presence have been growing in the Philippines. But there is much that remains to be done. The Philippines wants to maximize existing mechanisms that will further boost our trade and investments with Spain. We welcome the participation of Spain in the implementation of President Duterte’s 10-point socio-economic plan. We look forward to the entry of more Spanish firms, particularly those involved in infrastructure development, as the Duterte administration ushers in the Golden Age of Philippine Infrastructure Development through its “Build! Build! Build!” Policy. During my tenure as Ambassador of the Philippines to Spain, I will also work towards the establishment of a Philippine Center. The Center will be a one-stop shop of services for Filipinos in Spain, while also serving as a venue where Spanish-Filipinos can go in order to reconnect with their heritage, and where Spanish tourists can go whenever they wish to learn about anything related to traveling in the Philippines. The coming years will surely be an exciting time for Philippine-Spanish relations. Spain remains one of our most valued friends. The special relationship built on years of mutual respect and admiration will certainly be reinforced in the years to come. What ways can Philippines and Spain collaborate in? The Philippines and Spain share so many things in common that it is easy for both countries to collaborate on issues and projects of mutual concern.We recognize Spain’s many development assistance and projects in the Philippines. I am also aiming for more economic cooperation and activities between the two countries. The value of Philippine investments in Spain is considerable. I hope that Spain will likewise look to the Philippines’ potential to host more Spanish firms and companies. What’s your dream for Filipinos in Spain? I want them to be proud of their identity, to be comfortable with their place in society while maintaining affinity for the Philippines. Our citizens here should be the Philippines’ambassadors in Spain. This is why I am working hard to have the Casa Filipina, which will showcase the best in the Philippines. This will be a source of pride for the Filipinos because they will have a space that is devoted for their social, cultural and economic growth, as well. I am also in the talks with the Catholic Church to give the Filipinos their own church. The 500th anniversary of the circumnavigation of the globe by Magellan and Elcano is coming up soon, what does this mean for the Philippines and how can both countries take advantage of such a historic event? This is truly an important event in many ways—in the fields ofgeography, world politics, global economy, etc., but we also see it asa chance to reflect on how our two countries have changed, and to see that we are now both equal sovereign states and nations. It is also important to learn about each other’s understanding of this event that ties our nations together, and to consider what that says about our respective countries’ values, and how important it is to reconcile these narratives to arrive at an understanding of what that point in history meant to each country. We are privileged to be part of this historic event, and we are planning a series of activities are planned to commemorate it. You’ve been an Ambassador for close to twenty years, now, and you’re also a very successful businessman. What drives you to continue towards the path of public service? Service to the people is what drives me. Although my family has told me many times to just quit the foreign service and devote myself to my personal and business interests, I tell them that my intention to help my country is what pushes me. For as long as I can, I will continue doing what I think is best for my people and country. What are your priority projects right now? Aside from the aforementioned Casa Filipina, I am pushing for a Philippine-Spain Dual Citizenship Treaty as well as more academic exchanges between the Philippines and Spain. We also wish to increasing bilateral trade, and we hope that Spanish tourist arrivals to the Philippines will double in the next few years. The Filipino Community is of great importance to me, as well. I want to further engage the Filipinos here in Spain. The Casa Filipina is for them. They will want a center that speaks proudly of their proud heritage and exciting future. I want the Filipinos in Spain to be better integrated into the host country, so they can develop to their fullest. What’s something about the Philippines that Spanish people don’t know? There’s a lot! We have a country of over 106 million population and over 150 languages and dialects. We are a unique melting pot of cultures. It is worth nothing that many Philippine languages have borrowed a lot of Spanish words, so I think a Spaniard who has never been to the Philippines would find so many surprisingly familiar things. In a sense, once Spain left, the Philippines became a time capsule of Spanish customs and languages, so going to the Philippines could allow a Spaniard to learn so much about his or her own history. Last year, the Philippines and Spain celebrated an important milestone in their bilateral relations, in which we marked the 70th anniversary of the establishment of our diplomatic relations. The signing of the Treaty of Friendship in 27 September 1947 strengthened the already-strong historic bonds between our two countries. Since then, the Philippines and Spain have concluded over 60 bilateral agreements in various fields. These include agreements on education and sports, cultural cooperation, tourism, technology, investments and other equally important areas. The most recent of these was the Air Transport Agreement signed on 12 June 2018. These agreements attest to the fact that the Philippines and Spain have been working hard towards strengthening our relations through the years. It is also worth mentioning that, on top of these agreements, the Philippines passed a law on 22 July 2002 marking the 30th of June of every year thereafter as “Philippine–Spanish Friendship Day.” The date coincides with the anniversary of the end of the Siege of Baler where the last remnants of Spanish colonial forces held out for 11 months against Filipino revolutionaries. As a gesture of friendship, and in recognition of their valor, then-President Emilio Aguinaldo granted the survivors safe passage to Manila, en route to their return to Spain. This law was approved on 05 February 2003 and further sealed the bond of friendship between the Philippines and Spain. “Philippine-Spanish Friendship Day” commemorates the cultural and historical ties of friendship and cooperation between our two countries. It is now a national special working holiday and a special non-working holiday in Aurora Province in the Philippines. On 30 June 2011, the Spanish Congress of Deputies, through Speaker Jose Bono Martinez, made a historic Institutional Declaration on the occasion of the 9th Philippine-Spanish Friendship Day. A similar declaration was made by the Spanish Senate, through Senate President Pio Garcia-Escudero Marquez, a year later. Through the years, our countries have also seen exchanges of high-level visits, with the latest being Queen Sofia’s visit to the Philippines in 2012 and President Benigno Aquino’s visit to Spain in September 2014. In addition, there is a regular high-level political consultation mechanism between Spanish and Philippine diplomatic officials to take stock and plan for the future of our bilateral relations. This level of engagement, its quality and quantity, speaks volumes about the direction both countries want to take as far as our bilateral relations are concerned. Beyond the political sphere, Philippine investments in Spain, notably in wine and brandy manufacturing and real estate, is on the rise. We are upbeat about the huge possibility of major Philippine brands coming into Spain in the next few years. Likewise, Spanish investments and presence have been growing in the Philippines. We have made much progress, but there is still more that remains to be done. In 2017, Spain ranked as the Philippines’ 27thlargest trading partner, 26thexport market and 26th import source. Total bilateral trade reached USD602.60 million, of which exports to Spain amounted to USD 195.30 million and imports to the Philippines pegged at USD407.30million. The Philippines has expressed its desire to take full advantage of existing mechanisms to further boost Philippine-Spain trade and investments. It is hoped that more Spanish businesses, particularly in infrastructure development, will come to the Philippines in line with the thrust of President Rodrigo Duterte’s administration to usher in the Golden Age of Philippine infrastructure development through its “Build, Build, Build” program. The coming years will surely be an exciting time for Philippine-Spanish relations. Spain remains a most valued friend of the Philippines. The special relationship built on years of mutual respect and admiration will certainly be reinforced in the years to come. The Philippines is one of the fastest-growing economies in the Asia-Pacific region, and there has never been a better time to invest than now. With a population of over 100 million, the Philippines aims to sustain its sound macroeconomic fundamentals and investor confidence with a comprehensive national strategy focused on creating globally competitive, value adding, innovative industries. To this end, the Philippine government has placed great importance on partnership with the private sector and maintainingan enabling business environment, especially in view of the challenges posed by regional integration. To fast-track efforts in boosting key growth industries, the government is strengthening its collaboration with the business community, to keep the country’s economic momentum and to realize a truly inclusive, innovation-led growth that spurs economic prosperity from the bottom of the pyramid. Teeming with natural resources and boasting staggering landscapes, the Philippines does not disappoint those who go the extra mile to reach it. Indeed, nothing compares to the abundance of diverse natural resources offered by the Philippines. However, it is the Filipino citizen that makes the country truly wonderful. Even when faced with adversity, Filipinos are the warmest and most easy-going people anywhere. Filipinos are noted for their courtesy, hospitality and, most of all, talent. Competent, multi-skilled and highly trainable, the Filipino worker can surpass any other in dedication and hard work. The country is blessed with an educated, multi-cultural, bilingual and skilled labor force. In the 2017 World Bank – International Finance Corporation Doing Business Report, the Philippines once again improved its ranking, placing 99th compared to 103rdin the previous year. Since 2011, the country has climbed 49 spots in the Doing Business Report. The 2017 report measured regulatory factors that have an impact on the areas of the life of a business. The Philippines boosted its ranking in protecting minority investors, dealing with construction permits, paying taxes and enforcing contracts. The country also sustained its position in registering property and trading across borders. These indicators show that the Philippines has a low-cost, economically-sound, and cosmopolitan environment in which to do business. The Philippines is set to achieve the status of upper-middle-income economy in 2019. In addition, with its favorable demographics and rapid growth in global trade, the Philippines is expected to become the 16th largest economy in the world by 2050, according to estimates by HSBC. The Philippine economy has consistently grown between 6 and 7 percent per year for the majority of the last decade. It has enjoyed a string of upgrades in recent years from credit raters recognizing the country’s improving fundamentals. The Philippines continues to enjoy investment grade status since its upgrade by Fitch Ratings, Standard & Poor’s (S&P), and Moody’s Investor Service in 2013. The country’s rapid growth is fueled by higher investment opportunities and consumption as well as the growth of manufacturing, trade, and real estate, renting, and business activities. Philippine exports have substantially grown over the last decade, earning $69 billion in 2017, from only $41 billion in 2005. And after averaging $1 billion in foreign direct investment inflows annually in the first decade of the 2000s, in 2017 the Philippines attracted more than 10 times as much. There is also evidence that the country’s growth has become more broad-based, and its benefits more inclusive. Whereas private consumption spending had predominantly driven the economy’s growth in the past, investment spending, which has grown consistently at double-digit annual rates since 2010, now contributes much more to GDP growth. The Philippines is among the world’s top outsourcing destinations, thanks in large part to low business costs and a large pool of university-educated, English-speaking and highly adaptable workers. The Philippine business process outsourcing sector grew at 19 percent a year from 2011 to 2015. The IT and Business Process Association of the Philippines (IBPAP) targets US$40 billion in revenues and a 15 percent global market share in 2022. The World Bank also anticipates the sector’s expected revenues of US$35 billion in 2018 to overtake the projected value of remittances. Collectively, the industry provides services for a wide range of prominent Fortune 1000 firms in North America, Asia, and the European Union. The Philippines is the global leader for voice business process management services and the second most-preferred location for non-voice services, showing capability in areas such as healthcare, IT, finance and accounting, human resources and creative processes. In 2016, a Tholons study ranked Metro Manila second and Cebu seventh among the “Top 10 Outsourcing Destinations,” while Davao City, Sta. Rosa, Bacolod, Iloilo City, Dumaguete, Baguio, and Metro Clark were in the Top 100. The IT-BPAP also seeks to provide 500,000 jobs outside of Metro Manila by 2022. Among the activities eligible for Philippine Economic Zone Authority (PEZA) incentives are: IT-enabled services such as BPO, call centers, data encoding, transcribing and processing; software development and application; and content development for multimedia or internet purposes. As of October 2016, there are 243 operating IT Parks or Centers in the Philippines. These zones serve as one-stop shops for e-services investors who may want to locate in the Philippines. Manila, Baguio, Cebu and Davao are known as the country’s information and communications technology (ICT) hubs. Outside Metro Manila, there is also the rapid development of regional ICT hubs in locations such as Bacolod, Bohol, Cagayan de Oro, Clark, Dumaguete, Iloilo, Legaspi, Lipa, Naga and Rizal. Many of these, along with those cited by the Tholons report, have also been proclaimed by the IBPAP as Next Wave Cities beyond the capital that are conducive for investment. Tourism is another bright spot in the economy. Foreign visitors to the Philippines in 2017 reached an all-time high record of more than 6.6 million, marking an unprecedented growth in the country’s tourism industry. There are 10 international airports in the country with several slated for major renovations via Public Private Partnerships (PPPs). Key gateways include those in Manila, Cebu, Davao, Clark, Pampanga and Laoag. The Ninoy Aquino International Airport is the country’s main airport. It has five terminals, some servicing domestic routes, and other servicing international flights to Asia, the Middle East, Europe, and North America. The country has been upgraded to a Category 1 rating in Aviation Safety by the US Department of Transportation’s Federal Aviation Administration, allowing local airline companies to expand their operations in the US. The European Union (EU) has also allowed local carriers Philippine Airlines and Cebu Air, Inc. to fly into European airspace as recognition of the airlines’ commitment to safety and full compliance with international aviation safety standards. The Mactan International Airport in Cebu has regular flights from Busan, Doha, Taiwan, Hong Kong, Singapore and various other cities in Korea, China and Japan. The Davao International Airport has regular flights from Indonesia and Singapore, and seasonal flights from Macau. The Clark International Airport in Clark has regular flights from Hong Kong, Doha, Dubai, Macau, Singapore and various cities in Korea and Malaysia. The Subic International Airport in Zambales has regular flights from Korea and Macau, while Laoag International Airport in Ilocos Norte has regular flights from Macau. Kalibo International Airport in Aklan has regular flights from Taiwan and various cities in China and Korea. Other international airports in the country are the Puerto Princesa International Airport in Palawan, Zamboanga International Airport and General Santos International Airport, which are both in Mindanao. By sea, major cruise ships and international container vessels call at the port of Manila. Interisland ships connect Manila to major ports in other provinces. The National Statistical Coordination Board reported that manufacturing growth has continued to accelerate. The manufacturing industry posted a 14.4% growth in 2016. This comes as the government has rolled out the inter-agency Philippine Manufacturing Industry Roadmap, which aims to have the industry account for 30% value added to the economy and generate 15% of total employment by 2025 compared to 22% and 8%, respectively, back in 2012. Phase I of the roadmap from 2014 to 2017 focused on automotive and aerospace parts, electronics, garments, food, resource-based industries, chemicals, furniture, tool and die, and shipbuilding. Phase II from 2018 to 2021 shifts to high value-added activities and investments in upstream industries such as chemicals, iron and steel, med-tech basic and fabricated metal, link and integrate industries, small- and medium-sized enterprises and large firms, and the innovation ecosystem. From 2022 to 2025, Phase III will move to high-tech activities, transport, electronics and chemicals as well as participate as manufacturing hubs in regional and global production networks for automotive, electronics, machinery, garments and food. Foreign direct investment (FDI) in the Philippines as of 2017 reached USD 10 billion, up from USD 7 billion received in 2016, with the bulk of equity capital investments channeled to manufacturing. This growth in FDI is expected to continue, as a result of the Philippine economy’s upgrade into investment-grade territory. The construction sector remains a top growth contributor on the back of strong private real estate development activity as well as the government’s Public-Private Partnership program, strategic infrastructure projects, and disaster reconstruction. In the fourth quarter of 2016, the construction industry grew by 11.1%, compared with the 8.2% growth in the past year. Public investment in infrastructure expanded by 23%, which is higher than the 20.1% growth rate in the third quarter, while the private sector grew significantly by 16.2%. The outlook for the Philippine construction industry remains positive as it is expected to continuously grow over the forecast period between 2016 and 2020. The Philippine construction industry is expected to record 9 percent real growth in 2017 and 8.5 percent in 2018. This is largely due to the Philippine government’s flagship Build, Build, Build(BBB) infrastructure program, which aims to spend more than USD 144 billion in infrastructure between 2016 and 2022, as well as the USD 24 billion worth of financing and investment deals signed in October 2016 during President Rodrigo Duterte’s visit to China. Key infrastructure projects under the BBB Program include the Subic-Clark Railway; the North-South railway projects connecting Los Baños, Laguna to Tutuban, Manila and Clark Freeport in Pampanga; a 1,500-hectare industrial park in Clark, Pampanga; and an expanded Clark International Airport also in Pampanga. Other projects include four new energy facilities; 10 water resource projects and irrigation systems; five flood control facilities; and three redevelopment programs. Industry growth will emerge from the country’s development plan, Vision 2021, as well as population growth, urbanization, and favorable government policies with regards to PPPs. A total of 26 major public-private partnership (PPP) projects were awarded in December 2017. According to the Philippine Department of Environment and Natural Resources (DENR), the country’s estimated mineral reserves are placed at about 14.5 billion metric tons of metallic minerals and about 67.66 billion metric tons of non-metallic minerals. It is also the fifth most mineralized country in the world, third in gold reserves, fourth in copper, and fifth in nickel. In the mining statistics released by the Mines and Geosciences Bureau in February 2017, the gross production value in mining amounted to a total of PhP100.6 billion. The Philippines currently hosts 41 operating metallic mines consisting of 27 nickel mines, six gold mines (with silver as co-product), three copper mines (with gold and silver as co-products), four chromite mines and one iron mine. The Philippines is already the world’s second largest producer of geothermal energy, with a still untapped resource potential of 2,600 megawatts. There is an untapped potential of 70,000 megawatts for wind energy and 13,097 megawatts for hydropower. A total of 724 renewable energy service contracts with aggregate potential capacity of 14,498 megawatts were awarded as of the first half of 2016, while the total installed capacity was 4,132.5 megawatts. Of these contracts, 398 were hydropower projects and 160 were solar projects, 144 of which were on-grid and 16 were own-use. The Philippines has a high-profit potential from biodiesel exports and is a large producer of coconut and sugarcane, two major sources of biofuels. With a total of 11 ethanol plants operating in the Philippines this year, the production is estimated at 322 million liters. The 2012-2030 Philippine Energy Plan prepared by the government estimates that under a low carbon scenario, renewable energy’s contribution to the country’s total power mix will grow by an annual average of 3.2 percent and comprise a 37.1 percent share. The Philippines has about 10 million hectares of agricultural land and is a major exporter of banana, coconut, pineapple and fishery products, with farming outputs contributing around 10 percent of the country’s gross domestic product. Sugarcane and coconut are major sources of renewable biofuels such as bio-ethanol and coco-diesel. The agriculture sector accounts for 27 percent of the total labor force. The sector as a whole grew by 3.9 percent in 2017, exceeding the target annual growth rate set by the government. The total production value of Philippine agriculture was valued at USD 9.6 billion for 2017, up by 9.32 percent from the previous year’s record as the crops, livestock and poultry subsectors registered significant gains. The Philippines offers a highly educated and literate workforce, with most people having a good command of the English language. The UNESCO Institute for Statistics records an adult literacy rate of 96.62% among Filipinos aged 15 years and older while according to the UN Population Division, the median age is 24.2. The country’s labor market is one of the most competitive in the world, ranked 4th out of 61 economies in the 2016 International Institute of Management Development (IMD) World Competitiveness Report. In the World Talent Report also released by the IMD, which focuses on countries’ ability to develop, attract and retain talent based on three factors, the Philippines ranked 23rd in the readiness factor. Among all criteria, the country performed well in terms of the availability of skilled labor (4th), the availability of competent senior managers (14th), language skills (18th), and the international experience of senior managers (21st). It also ranked in the upper half of economies when it comes to the sufficiency of apprenticeships (23rd) and the importance given to employee training in companies (25th) under the appeal factor. Out of 138 countries, the country ranked well in the higher education and training pillar of the World Economic Forum’s Global Competitiveness Index 2016-2017, with the extent of staff training (31st), quality of management schools (41st), quality of the education system (44th), and local availability of specialized training services (48th) as contributing factors. It is also on track to meet its Philippine Development Plan targets related to enhancing the knowledge and skills of the workforce as higher education graduates as well as technical vocational education and training (TVET) graduates continue to increase. The Philippines-based company Emperador, Inc. is a major beverage producer with significant investments in Spain. In 2015, the company acquired Fundador Pedro Domecq, Spain’s largest and oldest brandy. The Emperador brand is now the world’s number one selling brandy by volume and the company has gone on to acquire a 500-hectare vineyard in Toledo in 2013. Spanish firms with investments and interests in the Philippines include Inditex, which opened its first Zara branch in Manila in 2005 and continues to expand; Construcciones y Auxiliar de Ferrocarriles (CAF), which is set to supply the Philippine government with 30 light rail vehicles; Acciona, which is currently undertaking major infrastructure projects such as bridge construction between Philippine islands;and Leche Pascual, which has partnered with Asia Brewery, one of the Philippines’ leading beverage manufacturers. “The best assets of the Philippines are its people.” Philippine Ambassador to Spain Philippe J. Lhuillier said during the awarding ceremony of the ten longest-staying Filipino workers in Spain and Andorra in June 2018 which was held in Madrid at the colorful Fiesta Filipina 2018 to commemorate the Philippine National Day. The award was the first in the 70th year history of the Embassy and was the brainchild of the Ambassador. “This award has long been overdue, I always believe that we should honor those who were there before us who served as inspiration and strength, not only to their families but also to overseas Filipino workers all over the world, particularly to those in Spain and Andorra”, said the Ambassador who was visibly very excited to meet the ten longest-staying Filipinos in Spain and Andorra. Mr. Eduardo Alvarado Fernandez was recognized this year as the longest-staying Filipino worker in Spain having been in Spain for 45 years. He arrived in 1972, initially to work in London, but decided to stay in Barcelona where he worked until his retirement. The story of Mr. Alvarado was echoed by the nine other awardees. All of them came to Spain to provide better future for their families. They all shared their grief, fears, and uncertainties of being in a foreign land on their own, away from their families. At very young age (most of them were in their early 20s when they arrived in Spain) , they braved home sickness and difficulties when they first came to Spain. Some almost gave up but they all won their battles and now shared their love for the country and the people that adopted them. Mr. Reynaldo Rojas Manzano has been in Spain for 38 years. He was hired in 1979 to work as a key puncher but when his company closed, he took any work he could find, including in farm lands where he would eat left over apples for lunch and dinner to survive while waiting to be paid by his previous company. Since he was exceptionally good, he was then offered a job in Hacienda where, at first, he thought that he would take care of animals and work in the farm, only to find out that it was the Ministerio de Hacienda, as key puncher. Hacienda is always known in the Philippines as a large estate where people work as farmers or animal care takers. This is one of the Spanish influences in the Philippines. Mr. Manzano never stopped and pursued his education while working and he is currently a computer system manager. Another awardee, Mr. Armando Gabriel came to Spain in 1978 with his wife and worked with the same employer for more than 20 years until their employer passed away, a story of loyalty and care which is shared by majority of Filipinos. The same situation was shared by another awardee when she took care of her employers for three years until she passed away without any salary or compensation because she said that her employer was family. There were of course funny and entertaining experiences such as that of nanny who during her first week of work heard her seven-year old ward shouting “socorro, socorro”. The child was climbing the fence but the nanny thought that she was calling a neighbor whose name was “Socorro”, which is a very popular name in the Philippines. There was this Filipino who firstthought that taxi cabs are free in Spain when she rode for the first time since there was a sign “libre”, which means “free or no payment” in Filipino. “It is heart-warming to hear their stories” said Ambassador Lhuillier. “I am very proud that I represent the people who are caring and loving and whose heart goes beyond their call of duty. But these stories are not uncommon of Filipinos”. Mr. Eduardo Fernandez Alvarado, 45 years in Spain. Ms. Adelaida Abrero Suyat, 42 years in Spain. Ms. Francia Berdalosa De Villa, 40 years in Spain. Ms. Editha Cariño Etrata, 40 years in Spain. Ms. Concepcion Piñon Zaragoza, 40 years in Spain. Ms. Leonida Honrada Hipolito, 40 years in Spain. Ms. Marjoling Madrid De Leña, 40 years in Spain. Mr. Armando Tiro Gabriel, 39 years in Spain. Ms. Ma. Luzviminda Roque Ramos, 38 years in Spain. Mr. Reynaldo Rojas Manzano, 38 years in Spain. There are approximately 50,000 Filipinos living in Spain, in addition to Filipinos who are already Spanish citizens. Philippines and Spain relations goes beyond its 70 years of diplomatic relations. Philippines or “Las Islas Filipinas” was named in honor of the King Philip II of Spain when the earliest recorded European expedition landed in the Philippines in 1521. The three hundred and thirty (333) years of Spanish influence in the Philippines is evident in the country´s cuisine, names, language, and many social and cultural aspects of the Philippine society. It is not surprising that the Filipinos can easily learn the Spanish language and assimilate to Spanish culture. “We are a universal people” said Ambassador Lhuillier as he narrated the influences brought about by the Chinese, Dutch, Portuguese, Japanese, Indians, Americans and many other cultures. “It is for this reason that we, as people, are at home in any culture.” He added. Spain is particularly important for Filipinos because of its historical connection. With more than three decades under Spanish rule, the Philippines is partly Spanish and its influence left a lasting impact to the Filipinos even to present times. It cannot be denied that Spanish is embedded in the Filipino culture. Numerous Spanish words are in the Filipino language. In fact, in the southern part of the Philippines, Chavacano which is a criollo language based largely on Spanish vocabulary is still widely spoken. In the same manner, several Filipino cuisines are of Spanish influence such as valenciana, adobo, estofado, adobo and many others. Most Filipinos have Spanish surname because the Spanish government decreed in 1849 the distribution of surnames and implementation of the “Spanish naming system” or the Catálogo alfabético de apellidos (“Alphabetical Catalogue of Surnames”). Dr. Jose Rizal, the Philippine National hero, studied in Spain. Paulino Alcantara Riestrá who played for FC Barcelona, who later became doctor was a Spanish-Filipino football player. Numerous professionals, artists and educators spent their time in Spain. Today, according to official statistics, there are more than 100,000 Filipinos who are Spanish citizens and around 5,000 Spanish citizens living in the Philippines. Filipinos are embedded in Spanish society as engineers, educators, businessmen, artists, sportsmen and other workers. Recently, Grupo Emperador Spain S.A., a wholly owned subsidiary of Emperador, has signed an agreement to acquire an additional 230 hectares of vineyard land in Toledo. It is owned by Filipino businessman Mr. Andrew Tan, who also owns the Torre Espacio in Madrid. Mr. Lucio Co, another Filipino businessman became a shareholder of Spain´s Williams & Humbert Wineries by acquiring a significant stake in the Jerez winery. The newly-appointed Philippine Honorary Consul in Barcelona, Atty. Chona Abiertas Tenorio, is a Filipino-Spanish Lawyer. “The Filipinos are certainly present in Spain. You see us work in restaurants and various establishments, educational institutions, business world, art circles, medical field and many other areas of the Spanish society. We are not only good and hard workers, we are also achievers, leaders and most of all, we have a big heart who loves what we do and do what we love. These ten awardees represent the love, dedication and commitment that I am talking about,” Ambassador Lhuillier said with a smile as he walked down to personally congratulate the awardees. While reasons vary for many people to choose Spain as their new home, one thing remains constant – Spain´s long history of embracing and welcoming peoples and ideas is a known fact. Even though the Philippines ceased to be a part of the Spanish empire, the Filipinos are among the many who have chosen to settle in Spain. Integration of Filipinos has made settling easy due to deeply intertwined common and familiar cultures and history. Some of those who found a new home in Spain have left marks in the Spanish society and popular culture. Isabel Preysler is one such Filipina whose celebrity persona continues to grace pages of magazines and TV programs. Her style and fashion remain to be a topic of discussion, along with her family life. She is the mother to the famous pop singer, Enrique Iglesias, who, in several instances, has recognized his Filipino roots. In the field of sports, Paulino Alcántara Riestrá, the Philippine-born football player, held a record for themost number of goals for FC Barcelona. His record was broken by Messi only after 87 years in 2014. Another Filipino-born football athlete was Marcelino “Chelin” Galatas who once played for the Spanish national team in 1927. Philippine-born singers Luis Eduardo Aute Gutiérrez and Antonio “Junior” Morales, father Shaila Durcal, have likewise left imprints in the Spanish music scene. Many other Filipinos are slowly making names for themselves in their own fields. It is estimated that there are over 40,000 Filipinos in Spain; however, the number is expected to be higher when one will include second and third generation Filipinos. The Filipinos in Spain are concentrated in the cities of Madrid and Barcelona, bringing their ways, ideas, care and talent into the Spanish society. They did comment, however, that the language barrier was the most difficult challenge faced by Filipinos coming to Spain in the past 30 years. Spanish was removed from among the official languages in the Philippines in the 1987 Constitution, leaving the current population with some understanding of Spanish but lacking the facility to communicate in it. It can be said that the Filipinos with superior Spanish competence are those born before 1945. Those who continue to speak it comprise the small yet active number of Spanish speakers. While some would lament about the state of the Spanish language in the Philippines, Filipinisms still found their way into the Spanish language since they were admitted by the Real Academia de Española. Amongthem are tuba (licor de palmera), yoyo (un juguete), abaca (cañamo de Manila) and dalaga (mujer soltera). The Filipinos´ lack of Spanish linguistic abilities is offset by their competence in the English language which is a prized skill for employment in Spain. More and more Filipino nannies are hired by Spanish families not only to care for their children but also to supplement their children´s training in the English language. We shall soon be seeing a generation of Spanish kids reared by Filipinos, whose nurturing attribute is known throughout. Furthermore, the contribution of Filipino workers in the tourism and service sectors in Spain is appreciated. Philippine companies and entrepreneurs have also found their way in Spain. The famed Sotogrande, the largest privately-owned residential development in Andalusia and playground of the rich, was founded by Filipino-Spaniards in the 60´s. Soon, a fifth tower in the Cuatro Torres Business Area in Madrid will rise thanks to a substantial investment by the Philippine real estate company Megaworld Corporation in partnership with Villar Mir Group. The addition of the new tower increases Philippine presence in the world of real estate. Torre Espacio, which houses several embassies in Madrid and is found in the Cuatro Torres Business Area, is also owned by Filipino magnate Mr. Andrew Tan of Megaworld. The city of Cuenca, some 160 km southeast of Madrid, is home to the Museo de Arte Abstracto Español, a museum founded by Philippine-born Fernando Zobel. His contribution to the growth of Spanish abstract art is widely recognized, impacting his adopted city of Cuenca and generations of abstract artists all over the world. A trip to this mountain city via the train would take you to the train station named after him. Five hundred years of interaction between the Spain and the Philippines have created influences over each other´s cultures and societies that go beyond family names and cuisines. The links established seal the bonds between the two countries and is worthy of a toast over San Miguel Beer, which, by the way, was originally brewed in the Philippines. Former Philippine Senator Edgardo Angara left a legacy in rekindling the already friendly and vibrant relations between the Philippines and Spain when he authored the law that institutionalized the celebration of Philippine-Spanish Friendship Day. June 30 is a day when President Emilio Aguinaldo commended the besieged Spanish soldiers in the Church of Baler for their loyalty and gallantry. To mark this momentous occasion, there is a need to declare said day a national holiday to remember the act of benevolence which has paved the way in bridging better relations between Philippines and Spain. The 30th of June of each year is hereby declared as Philippine-Spanish Friendship Day to commemorate the cultural and historical ties, friendship and cooperation between the Philippines and Spain. It is hereby declared as a national special working holiday and a special non-working holiday in Aurora Province. Every 30th of June in the Philippines, series of events commemorate that turning point in Philippine-Spanish history. It can be said that in recent years, no other Philippine legislator had championed Philippine-Spanish relations more than the late Senator Angara did. His demise on 13 May 2018 was not only a sad note in the lives of his family but also to the promoters of the relations of the two countries. Tributes all around poured in. During this year´s celebration of the Philippine National Day in Madrid on 12 June 2018, then Secretary of State for Foreign Affairs of Spain, Mr. Ildefonso Castro, in his speech, recognized the notable contribution of Senator Angara in advancing the Philippine-Spanish relations. Even days before he passed, Philippine Ambassador to Spain Philippe Lhuillier remembered meeting the senator in the Philippines to discuss the Embassy´s projects in Spain. “He supported all the proposed projects. He was excited at the possibility of a one-stop shop in Madrid,” Ambassador Lhuillier recalled his meeting with the senator. Among the recognitions received from Spain are Premio Casa Asia in 2010 and the Order of Isabel the Catholic, Great Cross, in 1995 when he was Senate President. His absence was palpable last October 8, when the world celebrated the International Day of the Galeon. He was one of the main actors who pushed for the UNESCO proclamation to institutionalize the celebration of the Galleon Day, which was a Philippine initiative. Since the start of the celebration in 2010, he had spearheaded activities in the Philippines that highlighted the Galeon Trade as a forerunner of globalization, and one of the longest-running successful shipping routes ever. He recognized that other than economic benefits, the galleon trade also brought interchanges of cultures, traditions and ideas among the peoples of the four continents. He may have left the world without a visible successor, among the current legislators, to champion Philippine-Spanish relations, but he left more than enough for future generations to appreciate the lasting relations that the Philippines and Spain have. The 500th Anniversary of the arrival of Europeans to the Philippines means different things to different countries and their people. To Spain, the voyage commissioned by the Crown since 1518 meant a celebration of the its role in the marvels of nautical science, astounding foresight toreach previously unknown lands, and the beginning of a glorious empire that was to last four centuries. To the Philippines, that first contact meant the beginning of its opening to the rest of the world, and unintentional it may be, the impetus in the eventual formation of nationalism—a common consequence of empire building—and the beginning of its journey towards nation-building. To the rest of the world, as some would argue, this was arguably a key milestone in the history of globalization, and thereafter the exchange of cultures, ideas, technology was spurred to unprecedented heights. Not surprisingly, the eventual disconnect in the narrative surrounding Spanish arrival in the country developed as each narrating country was constructing its national identity. Certain events are highlighted by storytellers, in this case the states, and proselytized among their respective local audience. One such example of this is the marked difference in the retelling of the story of Ferdinand Magellan’s death. Antonio Pigafetta, the Italian scholar who kept a detailed journal of the events of the voyage, wrote of how Magellan was besieged by natives in Cebu while attempting to help a recently Catholicized local ruler convert other rulers to Catholicism. Magellan believed that his display of force would convince the chieftains to become Catholics. That fateful decision and his miscalculation of enemy forces, led by LapuLapu, resulted in Magellan’s death when he was struck in the face by a Mactan warrior using a local scimitar, and the retreat of Spanish ships from Cebu. Forty-four years later, Spain would be back to successfully establish its first settlement in the islands, but that very first encounter in 1521 was marked by indigenous resistance. Few mainstream, Spanish reading materials make mention of how Magellan died. A book on Spanish history found at a popular museum souvenir shop in Madrid, for instance, note that he “died en route,” and often times if you ask a Spaniard what they know of how Magellan died, they would tell you that as taught in school, he died from a poisoned arrow. The emphasis on poison, often associated with cowardice, seems an allusion to the impossibility of a larger-than-life character like Magellan being killed by indigenous peoples living in a far-away land. In contrast, in the Philippines, Magellan’s arrival in the country is presented as the arrival of an interloper. His story begins upon arrival, and quickly ends in his death at the hands of a local warrior. That Filipinos highlight this fact is a constant reminder of their rare victory against colonial Spain and is rooted in, of course, nationalism, that has in turn, largely been shaped by Filipinos’ colonial experience. Unlike in Latin America, it is rare to find, in the Philippines, a public monument of a non-religious, political historical figure with Caucasian features. Filipinos are immensely proud of the fact that Magellan was killed in the Philippines. It is not the death of Magellan that is celebrated, but that Filipinos, through Lapu-Lapu, resisted. Lapu-Lapu is a hero, Magellan the villain is a story that every Filipino child can retell by heart. The difference in our retelling of a single history brings to fore what ought to be underscored by both countries as we celebrate the Spanish and Filipino encounter in 1521. This is a story that, in reaching 500 years, has a number of iterations but whose two leading ones—those respectively told by the Spaniards and Filipinos—should be reconciled. From the Filipino perspective, it is important to recall crucial elements in this story that have often been overlooked by Western historians in the past 500 years. When Magellan reached the archipelago, the island of Luzon to the north of Cebu was already home to societies for close to 17,000 years. Several “Datus” in Cebu who worked with the Europeans were clearly operating on their own network—of trade and familial relations—that enabled them to interact with Magellan and his crew confidently. From the 10th to 13th centuries, the archipelago hosted societies that were able to cultivate the talents of goldsmiths who crafted jewelry, regalia and other artifacts made from gold. These recent discoveries of a pre-colonial antiquity in a country whose climate and earthquake-prone geography often doesn’t allow for preservation of artifacts and architecture, evoke the precolonial past that Filipinos continuously seekas basis for a national identity that is free of colonialism. This is why Filipino nationalists are vexed when Westerners refer to the arrival of Magellan as the “discovery of the Philippines.” This fallacious, Western-centric phraseology has been repeated so many times in history textbooks that it will take several generations to expunge such language from educational materials, but also, crucially, the national mindset that this presentation of events helped to mold. For a group of people, it creates a conviction of inferiority to be told through Western-oriented social science classes that your country was discovered by someone else, and your heritage began from that discovery. Perhaps there is no stronger evidence of the strength of pre-colonial identity than in the existence and uninterrupted use of Filipino languages. Unlike Latin America, the Philippines has never been a fully Spanish-speaking country. This is another thing, perhaps, that makes this country different from the rest of Spain’s former colonies. People like to say that Spain never truly taught Spanish to the people of the country but this may only be partly true. What is remarkable though is that Pigafetta wrote a vocabulary of the Butuanon and Cebuano languages, with most of the words still widely used to this day by native speakers of that language. The fact is, after 333 years of Spain, and almost 50 years of American rule, the Philippines can still account for more than 175 of its languages. One may therefore argue that Spanish did not become a lingua franca because in the same way that Tagalog is not widely spoken outside of Luzon and parts of Mindanao dominated by Tagalog settlers, the local languages were more than sufficient in communicating effectively among each other. The Philippines is a country of passing conquerors and politics, but what remains constant through it all is its local languages. It is important to note that the Philippines has only ever been independent for 120 years, versus the 333 years of Spanish rule from 1521-1898. There are so much in the Filipino psyche, language and traditions that come from Spain and that Filipinos are little aware of as they’ve been entrenched so irrevocably in the Filipino way of life. It is also hard to speak of the Filipino-Spanish relationship without mention of Catholicism, which was wholeheartedly embraced by Filipinos much more so than they did the Spanish language. The 500-year-old ties that bind the Philippines and Spain are long, enduring, rich and complex. As Spain and the Philippines celebrate 500 years of knowing each other, it is important to take stock of the things that define this relationship and find relevance and common meaning from this crucial, watershed moment in world history. Understanding the reasons behind certain narratives through a pragmatic view of history will surely allow both sides to learn more from each other, and from there, further develop bilateral and people-to-people relations that is forward-looking but fully acknowledges the past.